Year-round prayers, with Kavanot HaAri, three parts, arranged by R. Asher Margolies of Medzhybizh and Brody. [Lviv: Shlomo Yarish Rappoport, 1787]. First edition. Incomplete copy, several leaves lacking in Part I. Three parts in one volume. Part I – weekday prayers, Part II – Shabbat prayers, Part III – Festival prayers. The prayers in this siddur are according to Nusach Sefard, with the Arizal's corrections to the text of the prayers, and his abridged Kavanot. 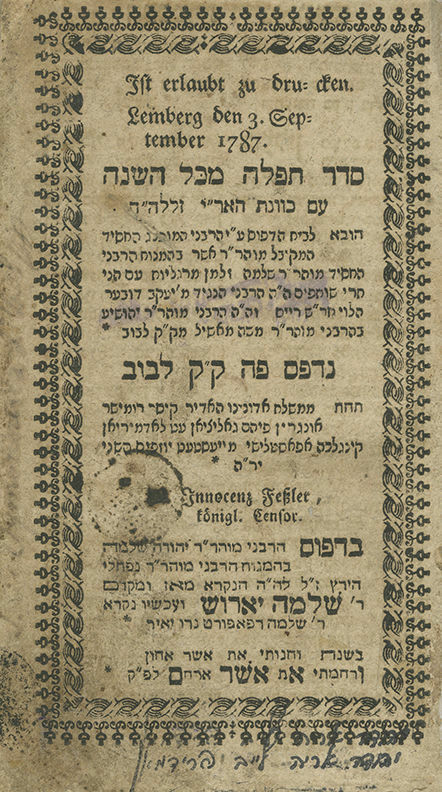 The siddur in this format was arranged by the scholars and kabbalists of the Brody Kloiz, and was first printed in Zhovkva in 1781. The text and kavanot in that edition were printed based on books of Chassidic teachings, and on Pri Etz Chaim (still in manuscript form at that time). In the present edition of the siddur, mistakes which crept into the Zhovkva edition were corrected, and additions were inserted according to other books based on the writings of the Arizal: Etz Chaim, Sefer HaYichudim, Machberet HaKodesh, and from "the siddur of the great kabbalist and chassid R. Shabtai of Rașcov", disciple of the Baal Shem Tov (a siddur which was still in manuscript form). This siddur was arranged by R. Asher son of R. Shlomo Zalman Margolies of Medzhybizh and Brody, a scholar of the Brody Kloiz, close disciple of "the great and prominent kabbalist, R. Chaim Sanzer of Brody… from whom I learnt much, particularly in this awesome and true wisdom" (from R. Asher's preface to his siddur). The siddur bears approbations from the scholars of the Brody Kloiz, in addition to an approbation by R. Yissachar Dov, rabbi of Zolochiv, a leading Chassidic figure. Imrei Pinchas HaShalem (I, pp. 223-224) states: "Their siddurim (of the disciples of the Baal Shem Tov) were the Arizal's siddur printed in Lviv (this edition), and they did not wish to pray from any other siddur, since the rabbi (R. Pinchas of Korets) prayed from this siddur and held it in high regard… and when this siddur was printed, they grabbed it like a precious stone and greatly treasured it". Since R. Asher's siddur was printed, R. Pinchas of Korets would pray only from it. The Sar Beit HaZohar, R. Tzvi Hirsh of Zidichov (Zhydachiv), and the rebbes descending from him, likewise prayed from this siddur and adorned it with their notes. R. Yaakov Shimon, son of R. Pinchas of Korets, said: "One should only pray from the Lviv edition of the Arizal's siddur, or in the siddur of R. Shabtai, and not from other versions of more recent siddurim". Incomplete copy. Three parts in one volume:  leaves. Lacking four leaves: leaves [69-72] in the middle of Part I – weekday prayers. Leaves [162-164] bound out of sequence. 17 cm. Overall good-fair condition. Stains, light wear. Most leaves complete and in good condition. Tears and damage to title page. Tears and damage to several other leaves, some slightly affecting text. Leaves trimmed, affecting headings of some leaves. Wear and tears to final leaf, affecting text. Printing error to one leaf, affecting text in the lower corner. Censor deletions in several places. New leather binding.